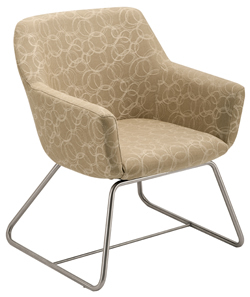 The Monash Lounge Chair is a generously proportioned chair designed for Healthcare Consulting Rooms, Reception Areas, Meeting Rooms, Boardroom and Break-Out Areas. Available in either skid or pedestal base versions. The stainless steel skid base frame has a wide base and reinforced with the crossbar to give additional stability and the pedestal is also manufactured from stainless steel an offers exceptional stability. Both versions feature Recopol™ recycled engineering grade plastic chair shells, commercial grade upholstery and GECA certified commercial foams.